Seeds of Kindness Goes Countywide.....Kindness Week February 15th~21st, 2010! Click Above to Visit Acts of Kindness! Artwork by artist, Dale Huey of Angels Camp. He created the original concept/design and donated his time, (an act of kindness) from our conversations about creating ripples of kindness. This year Seeds of Kindness Week reaches out to Calaveras County schools, businesses, co-workers and individuals, and actually, anyone who wants to participate. 13,000 light blue ribbons with pins will be passed on as “ripples of kindness” activities commence throughout the week-long event. Miles of light blue ribbon will be tied around trees, light posts, signs and more, resounding the kindness message throughout Calaveras County. With the help of Calaveras County Superintendent of Schools, John Brophy and school superintendents, all 22 Calaveras schools have been invited to participate. A request went out to the schools to appoint a “Kindness Crusader,” who would be in charge of distributing ribbons and instructions. Within one week, 10 crusaders have been announced, representing almost half of the schools. Each school will receive a Kindness Kit, including an official diamond shape, yellow Kindness Zone sign to post at the entrance to the school, hang at meetings and assemblies; a Kindness Zone proclamation; 600-feet of light-blue ribbon; logo art; “pass it forward” Kindness ribbons with pins; instruction cards; a CD with all information for making additional copies, and a list of kindness activities, opportunities and participation ideas, as well as contact information for where to go for additional information or supplies. Instructions for using the Kindness ribbons is simple: “Sign your ribbon. When you notice someone being kind, give them your ribbon to wear asking them to pass it forward. At the end of Kindness Week, place your ribbon where others will see it, reminding them to be kind, or mail your signature-filled ribbon and kindness story to The Seeds of Kindness, P.O. Box 677, Murphys, CA 95247.” Bergantz is also making plans to case the returned ribbons in the Calaveras County Office of Education building after the event. Participation is voluntary and free of charge. Through generous donations, the Seeds of Kindness Committee is getting closer to their goal of raising $4,700 to finance all of the supplies. Donations have already been received from the Calaveras County Office of Education, Mark Twain St. Joseph’s Hospital, Dr. and Mrs. Chris Iwata, Love of Children, Inc., Weber, Ghio & Associates, Inc., Jane Bottomley, Mike’s Pizza, Alan and Teri Grant, Bret Harte High School’s Interact Club, Debbie and Craig Lovett, Pacific State Bank, Calaveras Lumber, Native Daughters of the Golden West – Ruby Parlor, FCC and CFLC of Angels Camp, and Merita Callaway, Supervisor District 3. 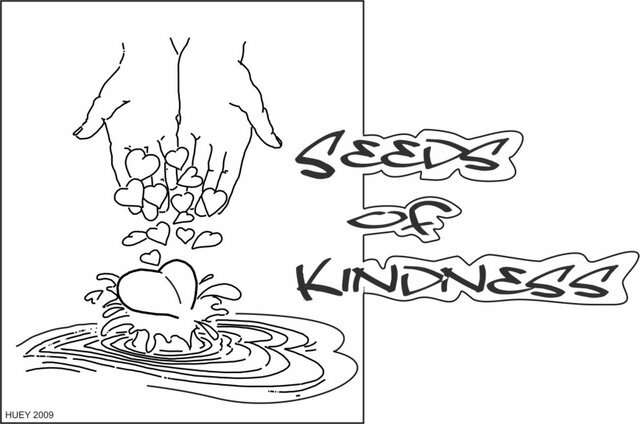 The Seeds of Kindness committee, consisting of a handful of spirited volunteers, is also in the process of working on an official Web site, and artwork for the new Seeds of Kindness logo has been donated by local artist, Dale Huey. Kindness activities could include anything from a smile and opening the door for a classmate or friend, to donating clothes to the Calaveras Crisis Center, deliver a cooked meal to a homebound senior or a stuffed animal to a child who is in the hospital. Ideas for kindness activities can be found online at theseedsofkindness.com or actsofkindness.org.